This is just a quick post to start off the week. We're moving locations at work this week so I will not be able to surf the net and update FF... not like I was allowed to anyway, so I will make posts either late at night or very early in the morning, like today. (Today is the second entry in a series of three entries that will feature images of Michael signing autographs back in September). This week is a good Fan of Michael Fassbender week as Eden Lake comes out tomorrow! I have to mail in my current Netflix DVD so that I can get Eden Lake next. I found this narly image of Michael/Steve the other day, and needless to say, it's cringe worthy. 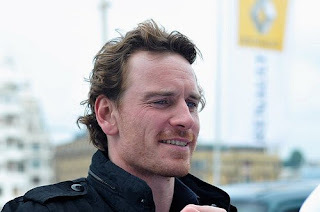 But people at Awards Daily are slowly waking up to the Fassy lad due to my unwavering comments in support of him. Here are two Hunger blog entries that endorse how spectacular this film is: A Year End list and Silence is Golden. It's nice to see such enthusiastic support for Michael and Hunger. The finishing touches are complete for the guestbook, and I think I'm done tweaking the blog for at least this week.